"Libya is too tough for UN Volunteers? I don’t agree with that," says Ghazi Mabrouk, a Tunisian UN Volunteer serving in the Libya office of the United Nations Development Programme (UNDP). "If UN staff are redeployed here, UN volunteers can also support this process and have all the skills needed to do it." UN Volunteer Communications Officer Ghazi Mabrouk (Tunisia, centre) with UN Volunteer Digital Communications Officer Jean-Pierre Kisamare (Burundi, right) and colleagues at the Libya Office of the United Nations Development Programme. The security situation in Tripoli is improving, so some UN agencies are relocating their offices back to Libya. 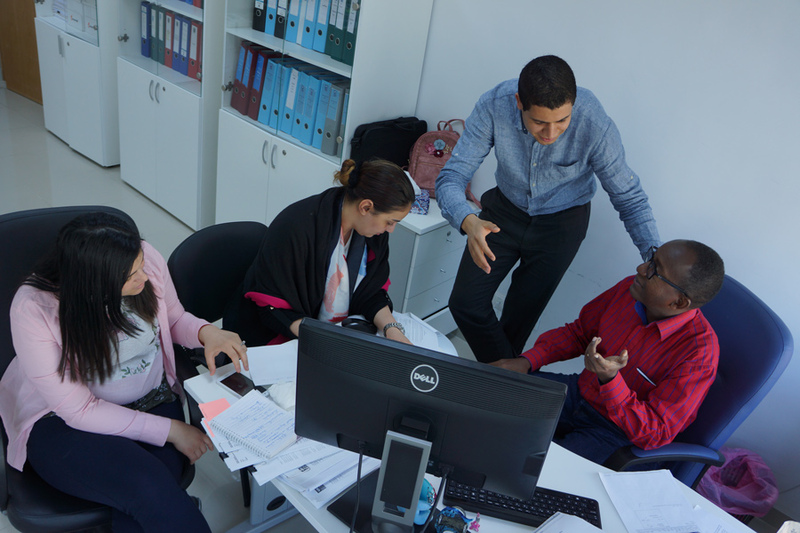 Over the past year, Ghazi worked as a national staff at the UNDP Libyan office in Tunis. At the beginning of June 2018, he moved to Tripoli as an international UN volunteer. In his daily work, Ghazi focuses on helping the UNDP Libya country office communicate its achievements, not only to the Libyan people but also to the world, particularly through social media. Visibility is vital to gain the support of Libyan people and the international community. UNDP’s current projects in Libya focus on stabilization, resilience, rule of law, transitional justice, elections and gender equality. In practice, UNDP is teaming up with local and international partners to rehabilitate schools, hospitals and other critical infrastructures. Since 2016, UNDP Libya’s largest project, the “Stabilization Facility for Libya”, has undertaken 285 light infrastructure rehabilitation projects around the country. That means that hundreds of Libyan children are now able to go to school again, and that Libyan hospitals and clinics are delivering better services to local residents. Another important project funded by the European Union, “Strengthening Local Capacities for Resilience and Recovery”, focuses on strengthening local authorities’ capacity to serve people in six Libyan cities. It helps them to provide basic services with access for vulnerable groups, enforce local stability and community security, and recover the local economy through job creation and supporting livelihoods. As a Communication Officer, Ghazi is managing UNDP Libya’s social media accounts (Twitter, Facebook, LinkedIn) and has the chance to interact with many internet users even in the most remote Libyan cities. "In Tunisia, after the 2011 Revolution, youth had many more opportunities to engage and have their say. In Libya, outside Tripoli, there are few NGOs and initiatives," Ghazi explains. "That’s why any UNDP activity addressed to the youth is usually met with a lot of enthusiasm." At the beginning of July, Ghazi delivered training to nine UNDP field reporters and coordinators working in six Libyan cities (Tripoli, Benghazi, Sebha, Al Kufra, Murzuk and Ubari). The stories and press releases they write are mainly published on UNDP website and social media accounts. Often, this information also reaches the pages of Libyan media in Arabic and English, always searching for reliable information, especially from the Center-South of the Country, where few reporters are based. "Libya is a crisis country; therefore, communication is much more sensitive than elsewhere. Information needs to be accurate because even a small mistake may cause problems," Ghazi explains. "That’s why we put accuracy at the top of our priorities. We cross-check information several times before publishing it." The three-day training also focused on how to search and deal with different sources of information, and on ethical standards in journalism such as independence, fairness and impartiality. Ghazi doesn’t feel like a foreigner in Tripoli. "The food is almost the same as in Tunisia. The culture is very similar. Libya is a neighbouring country close to the heart of everyone in Tunisia, and I want it to progress and fulfill its great potential." Will this become a reality? "I became a volunteer, because I believe nothing is impossible," Ghazi replies from his office in Tripoli.